One of the best things about summer is getting to spend time with family outside, taking in the fresh air—nothing’s better than spending a Sunday afternoon on a deck, and enjoying the weather with your loved ones. However, there are some outdoor safety precautions that you should take if you have a deck, and especially if you have children that’ll be spending time on it. Before you plan that big family BBQ, take a look at these deck safety tips to ensure your family has a safe summer outdoors. Fasteners and connectors are what hold your deck together, so you want to make sure you check up on them annually to monitor any rusting. Nails, bolts, screws, and hangers are all made of galvanized steel but still need to be inspected closely—even high-quality materials run the risk of rusting. If you see any signs of rusting or loose nails and screws during your initial inspection, you’ll want to get a professional to take a look to ensure there are no serious structural risks; if there are, it’s a good idea to refrain from using your deck until they’re addressed. Wooden decks can experience splitting and cracking, but don’t be too alarmed, this comes naturally with wear. Small cracks are usually nothing to worry about, but if you notice them expanding and continually getting larger around fasteners, that’s a sign of weakness. Expanding cracks can be caused by water getting into them, and freezing. It’s important to note that cracks between joists can be an extreme weak spot, and should be repaired by a professional immediately. 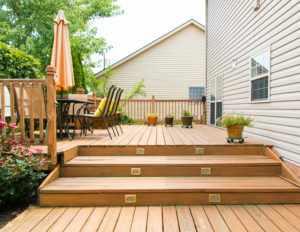 Rotting wood can be detrimental to your deck, and it should definitely be addressed as soon as possible. No matter how small the area of rot may be, it’s a serious issue and should be treated as such. Staining your deck every few years can help prevent wood rot. Loose deck railings can be dangerous for children and adults alike; kids may fall through, and adults may lean against them and take a tumble themselves. To prevent any accidents, assess the sturdiness of your railings before having people over. Railings are supposed to be able to withstand 200 pounds of lateral force, so if they have any give when you push on it, you should have an inspector take a look; they may need to be reinforced. When it comes to deck building and keeping your existing one safe, trust the professionals. Total Fence Inc. has an incredible team of experienced staff members that will work to ensure that your project gets completed quickly, with quality in mind. We use high-grade materials for all of our jobs, so you can be confident that our skills aren’t the only thing that’ll make your fence long-lasting. Choose Total Fence Inc. for all of your post hole drilling services, to make sure that your home improvement investment lasts a lifetime. Contact us today to learn more about our services, or for a free quote.